For the German sports official and Richthofen's nephew, see Manfred von Richthofen (sports official). 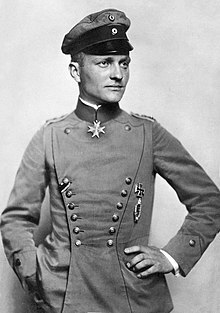 Manfred Albrecht Freiherr von Richthofen (2 May 1892 - 21 April 1918) was a German fighter aircraft pilot in World War I. His nickname was the "Red Baron". He is considered the ace-of-aces of the war, being officially credited with 80 air combat victories. The "Red Baron" is one of the most famous aviators in history and the subject of numerous representations in music, film and other media. He already received numerous honors and award for his exploits. Richthofen was born in Breslau, Germany. In August 1914, Richthofen became a cavalry officer in World War I. In May 1915, he joined the air service and became an observer. He did that because the training course was shorter and would get him to fighting faster. In October, he began training as a pilot. In March 1916, he entered combat. He had his first victory in April. In 1917, he was in command of a squadron nicknamed the "flying circus". He painted his airplane red so his fellow Germans could see him. Richthofen’s sixteenth victory flying a plane made him the best pilot in Germany in 1917. On April 21, 1918, Richthofen was fatally wounded, whilst flying low above the Somme Valley, near Amiens while fighting in France. He was 25 years old. He was chasing an enemy plane when a bullet passed through his chest. He then made a smooth landing, in a field on a hill near the Bray-Corbie road, just north of Vaux-sur-Somme. His Fokker Dr.I was not damaged by the landing. One witness, Gunner George Ridgway, said that Richthofen was still alive when he and other Australian soldiers reached the plane, but he died moments later. Another eyewitness, Sergeant Ted Smout, said that Richthofen's last word was "kaputt" ("finished"), immediately before he died. Canadian fighter pilot Arthur Roy Brown was officially credited with killing Richthofen. However, it is now generally agreed that the bullet that hit Richthofen was fired from the ground. The enemy buried Richthofen's body with full military honors. ↑ 1.0 1.1 Miller, Dr. Geoffrey. "The Death of Manfred von Richthofen: Who fired the fatal shot?" Sabretache: Journal and Proceedings of the Military History Society of Australia, vol. XXXIX, no. 2, 1998. ↑ Who killed the Red Baron? Exploring competing theories Pbs.org, (Public Broadcasting Service) NOVA, 2003. Retrieved: 13 June 2009. This page was last changed on 13 January 2019, at 17:03.